Vin Diesel posted the first image from the upcoming Bloodshot movie on social media. The latest photograph comes after a comic book version of the actor in character was revealed back in October. The drawn comic version gave cool insight into what Diesel will look like with pale skin and a big red spot on his chest, looking a lot like the source material, which made fans pretty happy. Now, we have a look at Diesel in the flesh for the Bloodshot movie and there’s no mistaking that it’s Diesel in the picture. As far as first images are concerned, this leaves a lot to be desired. 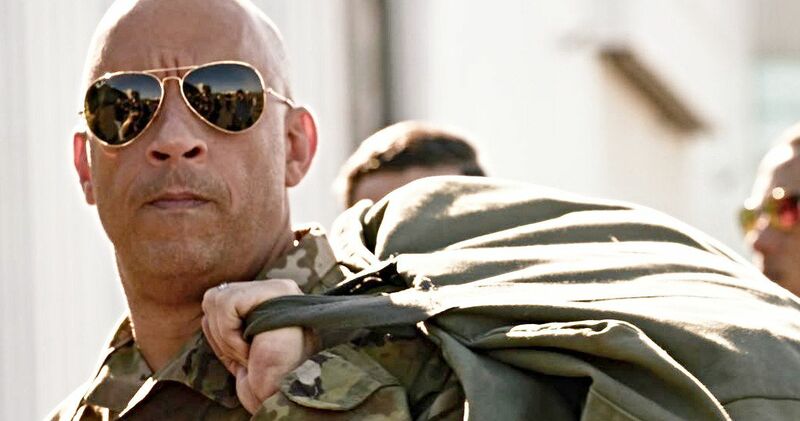 For one thing, Vin Diesel is shown in camouflage with aviator sunglasses on. In other words, this looks like it could have been from any of the Fast and Furious movies, or anything else the actor has ever done and nobody would be able to tell the difference. However, it’s these kinds of teases that will start to build hype for the Bloodshot movie over time. Let’s just hope we get a better look sooner than later. Vin Diesel is Ray Garrison in the Bloodshot movie. The latest picture from the movie is reportedly before he goes into some experimental testing against his wishes. The aforementioned experiment is called Project Rising Spirit and it wipes Garrison’s memory while nanites, which are tiny computers, are injected into his bloodstream. The character is able to shapeshift and communicate with computers in a way that normal humans can’t. In the comics, Garrison goes out to seek revenge on the people that are responsible for his new super powers and to learn about his past. Was he really Angelo Mortalli before he was Garrison? We’ll have to wait and see if the movie goes that route. We’ve yet to see Diesel as the fully transformed version of Bloodshot at this time, but the story might end up like that. Bloodshot has wrapped principal photography, but the project is mostly shrouded in mystery. We still don’t have a synopsis, so we don’t even know exactly what the story is about, though it looks like it will be a traditional origin story to introduce the Valiant Comics character to the big screen. With that being said, the movie doesn’t come out until 2020, so there’s still a lot of time to get everything dialed, including what Vin Diesel will look like as Bloodshot, which will more than likely be achieved through the use of CGI. Bloodshot hits theaters on February 21st, 2020 and will probably have to go through some reshoots between now and then. At the very least, Valiant Comics fans should be happy to know that everything is running smoothly and for the fact that Vin Diesel seem genuinely excited to get the promotional campaign up and running. Since there’s still over a year to go, it might be a while before we’re treated to an image of Diesel in full character. Until then, you can check out the first official image from Bloodshot below, thanks to Vin Diesel’s Instagram account.